It’s that time of year. The time of year when I struggle with my morals. Is it dishonest to hide squash in recipes? What if I adopt the “don’t ask, don’t tell” squash policy? Is it acceptable as long as I admit that I have once again hidden squash in a recipe if they ask? My daughter came into the kitchen and saw me grating potatoes and excitedly asked if I was making hash browns. I told her I was and asked her to get me a yellow squash and zucchini so I could add them. She was appalled and asked in horror if I was really going to “ruin perfectly good hash browns by adding squash”. And then I remembered that I was talking to the individual who clings to her dislike of summer squash. “Oh, I forgot that I was going to sneak in the yellow squash and then when you said you liked the recipe I was going to say, surprise they have squash in them”. She shook her head and said, “way to keep a secret mom” and walked away without getting me the needed squash. 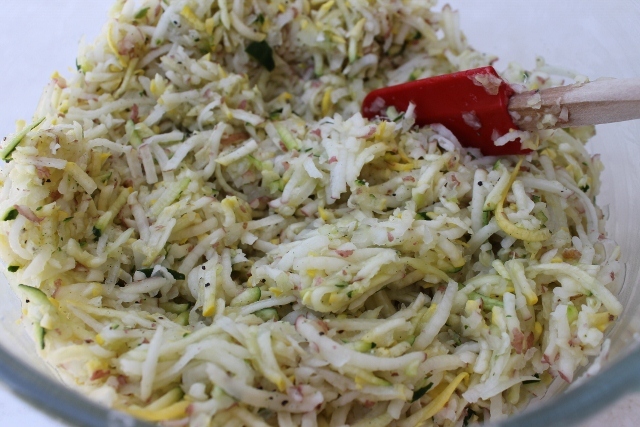 If your children do not like squash and you want to be covert about adding them to your hash browns, peel the squash, before grating so the color of the skin doesn’t stick out from the color of the potatoes. If your family likes squash, or if you have already given away your secret, leave the skin on the potatoes and the squash. The skin adds color, nutrients and cuts down on the time involved in preparing the vegetables. My daughter came back and asked if she could “try the hash browns made with the ingredient I’m not supposed to know about”. She said that she liked them better than regular hash browns and described them as more flavorful and went back for seconds. She could tell I was pleased, maybe because I exclaimed with delight “I knew you’d like them!” (need to work on my sneakiness). She leveled me with a glare and said, “I admit that your hash browns with squash taste better than regular hash browns, but I still think you over-utilize squash in your recipes each summer”. Yep, definitely have to work on developing my sneaky! If you have a food processor, run the potatoes, yellow squash, zucchini, onion, and garlic through it on the grate setting. If you don’t have a food processor, you can use a box grater to grate the vegetables. Squeeze the excess moisture from the vegetables. 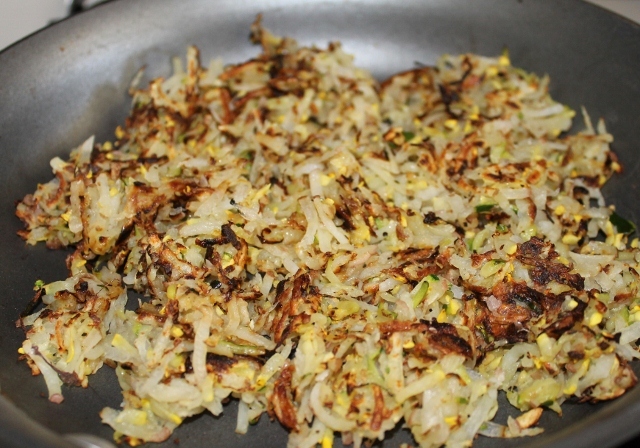 (Removing the liquid is essential to making crispy hash browns). Add the seasoned salt and pepper to the vegetables and stir to thoroughly combine. Add oil to a largest skillet you have. Spread the hash brown mixture evenly over the bottom of the pan. Cook over a medium high flame until the bottom is crispy, approximately 4 – 6 minutes. Then flip and cook until the other side is crispy, approximately 4 – 6 minutes. 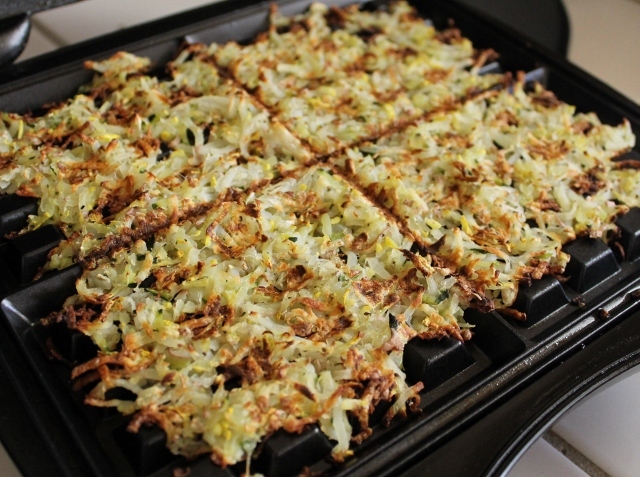 If you have a waffle iron, you can try cooking the grated vegetables in it. Brush or spray with oil. Place 1/2 cup of grated veggies over each square on the waffle maker. Spread evenly over the bottom of the waffle maker, lock the lid down, and cook for 8 – 10 minutes or until the hash browns are crispy and cooked through. Are you thinking what I’m thinking? Carrots, beets, eggplant?!? The possibilities for sneaking veggies into breakfast are endless! you should call them squash browns! LOL! Looks like someone else need to work on their sneaky skills. 🙂 That is actually a very good idea. Maybe I will call them squash browns once I work all of the potato out of the recipe, which I am hoping to do this weekend. I love this recipe but I am not sure I would be able to eat the whole recipe in one meal. Would I be able to freeze half of the grated veggies to save for another breakfast? Yes, you can freeze the hash browns. I place 1/2 cup of cooked hash browns or 1 waffle square in the microwave and heat it on high for one minute. That is a delicious idea! I found that grating the vegetables into a colander nested into a bowl helps reduce the amount of moisture on them because it’s able to drain out the bottom of the bowl. I made mine with red potatoes and white potatoes so it had a pretty blend of colors. I think it would be cool to make them in the Fall with sweet potatoes and winter squash or root vegetables like carrots and parsnips. This was so fun to read, and you made me laugh!!! I love the idea of using the waffle iron to make them, I am going to try that! Thanks for sharing your great idea of hiding veggies in things. I do it also, so I love to have company of other mothers doing the same thing. Do you think this would still work without the potatoes? We eat extremely low carb, so no potatoes. Yes, I think it would work if you replaced the potatoes with another medium summer squash and zucchini. You just want ~2 pounds of grated vegetables. Squash contains more moisture than potatoes, so be sure to do a really good job of squeezing out the liquid. This is so creative, and I love the idea of using the waffle iron! You can also “hide” squash/zucchini in carrot cake or carrot muffins, or puree it into a soup for a smooth base. Those are delicious ideas! I love the idea of using pureed squash as a base for a creamy soup. I am going to try my carrot cake recipe with summer squash this weekend. LOL…. I peel zucchini and grate to add to stuffed peppers and meatloaf because my husband doesn’t like “squash” either. I forget to tell him when I make pumpkin pie with squash too….. he thinks he can tell the difference. I also recently made Banana zucchini bread which he loved. I’m all for being sneaky with veggies! I love the idea of adding zucchini to stuffed peppers and meatloaf! I am looking forward to trying your ideas out on my family. If you like trying to sneak veggies into kid friendly foods….mashed sweet potatoes stirred into the cheese while it melts is a great way to add nutrients to homemade macaroni and cheese. (You may already do this, or you may not make mac and cheese, but this is the only recipe of yours I’ve seen so far, got it off of pinterest.) I’m very excited to try this. I LOVE squash, and am always looking for new pays to prepare it. Thanks!